When you are seeking a personalized tax plan designed to help you meet your business and personal goals, you need the assistance of an experienced lawyer who concentrates on such matters. At Palmer Law Group LLC, the primary emphasis of our practice is to create customized tax solutions for individuals and businesses. Our comprehensive tax law practice includes employee benefits, tax planning, estate planning, creditor protection, real estate and 1031 tax deferred exchanges. We also represent individuals embroiled in tax controversies. From our offices in Frederick, Maryland, and Northbrook, Illinois, we work with successful business owners and other clients located across and outside the United States. 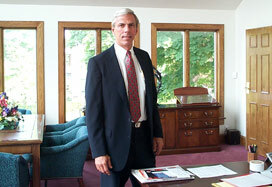 Our founding attorney, L. Guy Palmer, is a former Revenue Agent and Instructor with the Internal Revenue Service. His extensive accounting and knowledge of tax and other laws, combined with nearly 35 years of legal experience, enables us to help clients with a range of tax issues. For a sophisticated tax plan designed to help you meet your goals, contact our office online or call us at 301-695-0700 or 800-732-7907. We will take the time to understand your particular circumstances and create a customized solution for you. We offer initial consultations, generally done by telephone. We are available to help you 24 hours a day, 7 days a week and 365 days a year.